Right. I’m back from holidays, lovely, LOVELY holidays. And I’m NOT happy about it, don’t get too close…. But, let’s get back to business…I’m going to ease in on a quick one. 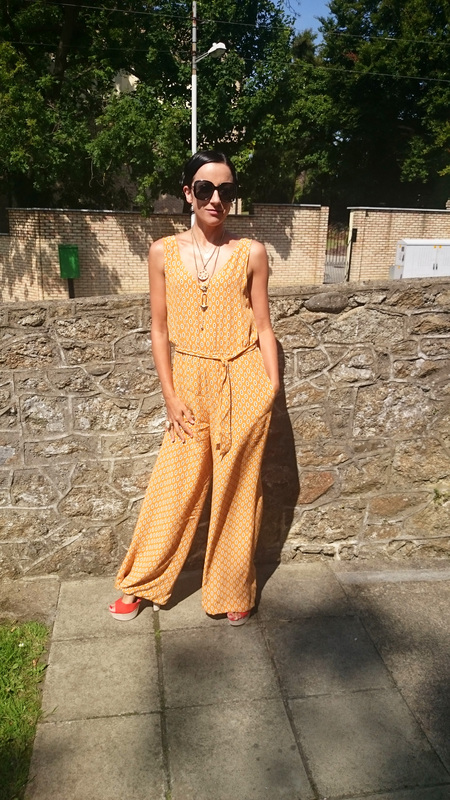 AGES ago I did a post called Rookies about new stuff in shops that had caught my beady eye and this Mango jumpsuit for €29.95 was a major forerunner. Because it is HOT and basically free. Naturally, your friendly fashion spend freak here picked it up and today to keep up the “I’m still in Spain, yes I am” buzz, I am wearing it. Wanna see….? There I am, in all my summertime glory. I have teamed my wondrous jumpsuit with some heels from Penneys and the layered necklace game of which I am a regular player, courtesy of Urban Outfitters and Zara. And of course, sunglasses, because the dream lives on. Clearly, this jumpsuit was made for a woman of Amazonian proportions because the length of the trousers in it were RIDICULOUS, so after tripping my way into work this morning, I stapled them up…I’ll sew it later (hahahahahahahahaha, I nearly believed that myself). Look closely and you will see my handiwork. Not that there’s a chance of that happening again for a LONG while.